"In the motion picture industry, a star vehicle, or simply vehicle, is a film written or produced for a specific star, regardless of whether the motive is to further their career, or simply to profit from their current popularity. It is designed to optimally display that star's particular talents or personal appeal." Like most A-listers Melissa McCarthy must keep her star ratings high by churning out these sorts of vehicles which highlight her specific brand. 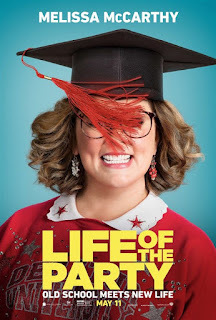 In Life of the Party McCarthy plays just another variation on the Melissa McCarthy character we've seen her do in The Boss, Spy, Tammy, The Heat, Identity Thief... and on and on. Sometimes these work out well (a la Spy) and sometimes not so much. This is more the latter. Life of the Party has very little story to it and leans on the predictable side. But it is all just there to showcase McCarthy and her incredibly likable persona and shtick. I venture that perhaps this, another in a line of vanilla, predictable comedies showcasing this persona and shtick, the persona and shtick might be starting wear thin. There is little of merit to this film except the moments when McCarthy's humourous riffs take over. Although some of those riffs were starting to feel a bit tired, not quite as funny as she has been. McCarthy has proven herself a real talent and quite a good actor when she wants to be. Perhaps it's time to leave these sorts of bankrolls behind and take the risks that take a talented performer like her out of the box she's in and up to a higher level. Perhaps it is time she graduated.